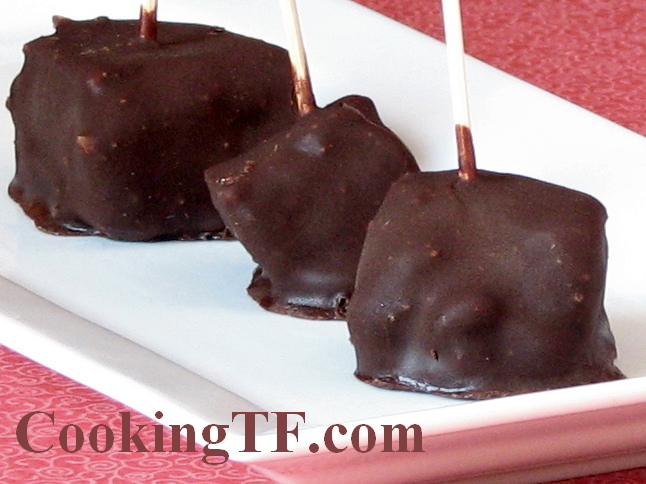 You are here: Home / Home Matters / Holidays / Happy Birthday to Me: Cheesecake Pops! Happy Birthday to Me!!!! My husband says I’m ageless and states that it’s the sixth anniversary of my 29th birthday. He’s a smart man. It’s also national Something On A Stick day. I decided I’d make myself something like cake pops to see what all of the fuss is about. Last week I was at the local salvage and I noticed they had cases and cases of the So Delicious Vanilla Greek Coconut Milk yogurt for $5. SCORE!!! I’m making cheesecake pops for my birthday! WHOOOO HOOOOOO! Prior to getting sick, cheesecake was my favorite dessert. While I’m back on dairy, my son isn’t quite there yet, so we’ve avoided doing things like cheesecake for his sake. It isn’t fun unless everyone is having fun, right? Even if it’s my birthday, I won’t make or eat a goodie in front of him if he can’t partake. So while I do drink Amasai and eat raw Havarti cheese from Beyond Organic and drink local raw goat’s milk, I don’t consume much else in the way of dairy. Since I scored on the yogurt, I decided to see if I could make a decent cheesecake from it. Happy Birthday! Today is also my son’s birthday – 4 years old. I had to LOL at the 6th anniversary of your 29th birthday – I’ve been saying that for years now (I just celebrated the 11th anniversary of my 29th birthday LOL) Anyhow, I hope you have a wonderful day and hope you really enjoy your cheesecake! Happy Day KerryAnn! Will the recipe be done in time for MY birthday tomorrow? =0 LOVE cheesecake, and miss it so! Kandy, I hope to have it out soon. I don’t want to post it until it’s correct. KerryAnn Foster recently posted..Happy Birthday to Me: Cheesecake Pops!